Chicago’s premiere dance music event has finally announced its 2013 lineup. 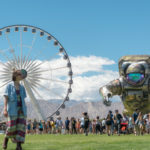 Headlined by Bassnectar, Calvin Harris and Moby the festival boasts over 50 artists representing a variety of dance music’s most popular genres. The legendary Crystal Method also make an appearance as well as sets from Wolfgang Gartner, Paul Oakenfold, Dirty South, Boys Noize and more. Leaning heavily towards the heavier sounds of electro, dub, and trap, Spring Awakening is a festival not for the faint of heart.